All boat operators must be a minimum of 18 years old (14 years old with a Safe Boating Card and accompanied by a parent on the same boat). Boat operators must produce, at time of the tour, either a state-issued driver's license or other state-issued ID that clearly shows date of birth. Any boat operator born after January 1, 1988 must have a Florida-issued Safe Boating Card or other NASBLA approved Safe Boating Card. If you do not have a safety card you can obtain one by taking the free online course at BoatUS prior to your arrival. Boat operators must bring a major credit card. Boat operators are responsible for any damage done to boats due to improper or unsafe boat handling or unathorized deviations from the tour group. Boat operators must sign our standard Liability & Use Release upon arrival. We recommend viewing a copy prior to your visit. Each boat has two seats, one for the operator and one for the passenger. 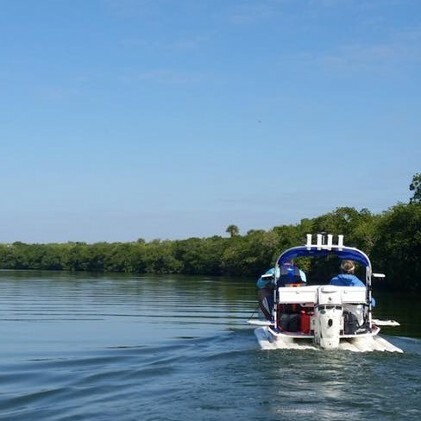 During the course of the tour, you will be provided with an opportunity to switch seats, provided the initial passenger is over the age of 18 (14 years old with a Safe Boating Card and accompanied by a parent on the same boat). The tour is paid in full at the time of the reservation. The fee will be refunded or the tour will be rescheduled in the event of bad weather. To provide us adequate time to rebook, all cancellations must be made 48 hours prior to your scheduled tour date to receive a refund. Alcoholic beverages are not permitted, and the guides have the right to deny access to the tour if they suspect any of the participants are intoxicated. No refunds will be made. Florida law dictates that all participants under the age of 14 must wear life preservers. While not required, it is recommended that all participants wear life preservers while underway, particularly if you are not a strong swimmer. All participants, regardless of swimming capabilities, must wear a life preserver at all times when the weather or waterway conditions are less than desireable or as directed by the guide. No messing around or wake jumping. Follow in a staggered single file until your guide instructs you otherwise. No swimming or jumping off the boats. We do not condone harassment of the wildlife, and we employ ethical viewing strategies. Please, no feeding or touching the wildlife unless instructed to do so by your guide. We strive to promote responsible and sustainable travel while providing a positive, authentic experience to all of our visitors. Please, no littering. Be aware of your surroundings and let's leave the environment better than we found it. Please help us to pick up small trash items if you happen to see any. Our guides will provide a container for trash. Thank you in advance for assisting us in keeping our gulf coast beautiful. Have a terrific time, stay safe, and we hope your adventure will be one that you remember for years to come! I UNDERSTAND THAT THERE ARE INHERENT RISKS INVOLVED WITH BOATING, including but not limited to equipment failure, perils of the sea, unpredictability of wildlife, acts of other participants or boaters, and adverse sea and weather conditions, and I HEREBY ASSUME ALL SUCH RISKS. I UNDERSTAND THAT I HAVE A DUTY TO EXERCISE REASONABLE CARE FOR MY OWN SAFETY, MY PASSENGER’S SAFETY AND THE SAFETY OF OTHER TOUR PARTICIPANTS AND I AGREE TO DO SO. I assert that I am PHYSICALLY FIT TO OPERATE OR RIDE on a boat and I will NOT hold RIDING THE WAVES, LLC or their guides, employees, agents or other associated personnel responsible if I am injured as a result of ANY problems (medical, accidental or otherwise) which occur while operating the boat or otherwise participating in the trip. I fully understand that RIDING THE WAVES, LLC has LIMITED MEDICAL CAPABILITIES and that in the event of illness or injury, appropriate care must be summoned by radio and treatment will be delayed until I can be transported to a proper medical facility. I agree in advance to these conditions. 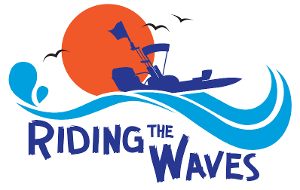 RIDING THE WAVES, LLC or its employees have made NO REPRESENTATIONS to me, implied or otherwise, that they or their guides can or will perform safe rescues or render first aid. In the event I show signs of distress or call for aid, I would like assistance and will not hold RIDING THE WAVES, LLC, their guides or clients responsible for their actions in attempting the performance or rescue of first aid. I AGREE TO FOREVER DISCHARGE AND RELEASE SKIP’S PLACIDA MARINA, LLC, RIDING THE WAVES, LLC, its guides, employees and agents, the owner(s) of RIDING THE WAVES, LLC, and affiliates, from any and all responsibility or liability for any and all injuries or damages. I agree NOT to make a claim against or sue any of the above parties for injuries or damages whether they arise or result from any NEGLIGENCE or other liability, EVEN IN CASES OF GROSS NEGLIGENCE. I further specifically agree, on behalf of myself, my heirs and assigns, to indemnify and hold harmless the released parties for any and all causes of action arising as a consequence of any incidents which might occur as a consequence of my participation in any boating and/or fishing activities with or involving the released parties. I CONSENT TO PHOTOGRAPHS taken of me during my participation in the tours, and to publication of the photographs by RIDING THE WAVES, LLC and it’s affiliates for advertising, promotional and marketing purposes.